At SKYN, we take care of your whole body, every inch of you! Our body treatments are designed to help you detox, lose inches, and relax. All ingredients are blended and mixed on the spot so that they are tailored to your needs. We use all natural muds, salts, and butters. Sometimes skin in those more intimate parts isn’t quite ready for a close-up. Due to bad Brazilian or Bikini waxes or problem skin, some of us are prone to in-grown hairs and discoloration. We can fix this problem, with the SKYN Vajacial treatment. On gently cleansed skin, the technician first deeply exfoliates ingrown hairs and clogged follicles with an organic enzyme and microdermabrasion. Skin is then warmly and comfortably steamed, ingrown hairs and acne are extracted, and a soothing organic mask is applied to close pores and tighten the skin. Skin bleaching can be add to get rid of dark spots or hyper-pigmentation. To top it all off a session of LED Light Therapy addresses dark spots and bacteria. A skin tightening session can also be added to help firm,tone,and tighten your bum or thighs. Your bikini line will look clear and free from in-grown hairs and bikini bumps. The way a bikini line should look! LED Light Therapy addresses sun and pigmentation spots: green light slows melanin production to stop pigmentation formation, blue light kills bacteria and acne, and red light helps the body produce new collagen and elastin. The VAJACIAL tightens, lightens, and plumps your intimate areas! 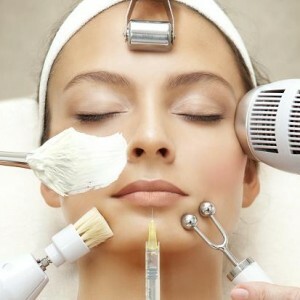 You can also add a VJAY Peel, to further lighten and even out your skin tone in that area. This customized body treatment helps to eliminate toxins and waste from the body, shape your muscles, tone, and lift and tighten your skin. You choose the type of scrub, body butter, and mud right from our blending bar. It is an amazingly nurturing experience that begins with a full body lymphatic dry brushing, cleansing massage and exfoliation. You will then relax during your mud bath, while you drift away under a warm body wrap and say goodbye to all your tension and cares for the day. All of this is followed by a skin conditioning application to sooth and brighten the skin. This treatment will cater to the very essence of all that is nurturing; your skin will be cleansed and relieved of toxic elements that cause illness and fatigue, and your muscles will be soothed and released, allowing a healing flow of blood and energy to restore vitality and movement. Sometimes skin in those more intimate parts isn’t quite ready for a close-up. You can fix this problem. On gently cleansed skin, the technician first deeply exfoliates ingrown hairs and clogged follicles with Diamond Microdermabrasion or an organic enzyme. Skin is then steamed, ingrown hairs and acne are extracted, and a soothing organic mask is applied to close pores and tighten the skin. The mask is then cleaned off and a session of LED Light Therapy addresses sun and pigmentation spots: Green Light slows melanin production to stop pigmentation formation, Blue Light kills bacteria and acne, and Yellow Light detoxifies and replenishes cells. With a session of skin tightening and cellulite reduction, Your bum will be as soft and clear as a baby’s bottom! This treatment removes dead skin, impurities and helps to eliminate sun damage, sun spots, and fine lines and wrinkles. The full body Microdermabrasion is followed by a hot towel cleanse that prepares the body for an organic body butter that is applied to the whole body, which leaves your body smooth and silky. You can also add a full body chemical peel for extra exfoliation. A chemical peel brings a significant improvement in skin rejuvenation. In this procedure, a low concentration of TCA is mixed with a special base prior to its application. Application of the peeling solution on the skin initiates the peeling process causing the topmost (dead layer of the skin) to slowly peel off. In a few weeks, healthier skin replaces the old skin. The process is like sanding the surface of a damaged table so that the scars and discolorations are less noticeable. Done in a series, chemical peels can reduce and eliminate scars, acne, and/or discoloration on the body. The hands are the part of your body that people see most often and the part of your body that begins to show the signs of aging before anywhere else. For this reason, the goal of reducing the visible appearances of aging is won of our most popular procedures. The treatments we offer can help you achieve youthful looking hands. After analysis, we create a plan to achieve the results you are looking for. A combination of chemical peels, microdermabrasion, laser treatments, and fillers are used to help reduce the appearance of wrinkles, lines, and age spots. LED light therapy can be used to jump start collagen production and give your hands a youthful glow. Most of us want to lighten our underarms or some of us suffer from ingrown hairs after waxing, or suffer from acne. This treatment is a facial for your underarm area. We exfoliate, extract, and re-hydrated the area to remove in-grown hairs and acne. Our products help with ingrown’s, and scars left after break outs.A Skin bleaching peel can be added to lighten the skin under your arms and even your skin tone out. Ask for more info about SKYN Bleaching.